If your contact information changes, you must update your information in your panel so you do not miss any important notices. The panel also shows who is designated as the owner of the account and who is authorized to contact DreamHost support for account specific issues. Log in to your DreamHost panel at https://panel.dreamhost.com. Navigate to the Get Started page. Click the 'Profile Information' link under your Username on the upper right. Your primary contact details designate the owner of the account, and who is automatically contacted with reminder emails as well as account-specific notification emails. Click the ‘Make Changes’ link to change your settings. This section controls what emails you receive from DreamHost and where they are sent to. Emails go to: Add your email and select the Primary radio button under it. This sets this email as the primary email that controls your DreamHost account. 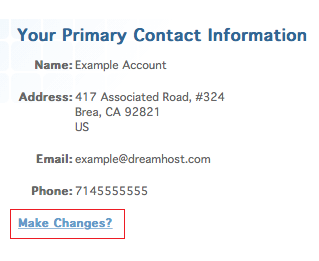 Changing your primary email address will change which email address can be used to log in to the DreamHost panel. Before changing your primary email address, make absolutely sure that the email address is entered accurately to prevent panel login issues. add one here: You can add a secondary email here to also receive account related email. This is useful if you need payment reminders sent to a specific person. If you add a second email address here, make sure you also do not add this email as a new user with Account Privileges. 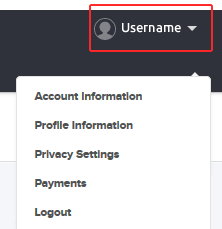 If you list a secondary email here, AND create a new Account Privileged user with this same address, the user will NOT be able to reset their panel password. 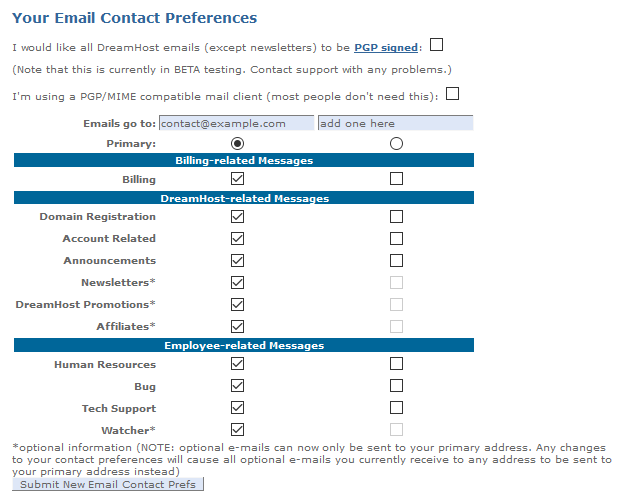 DreamHost-related Messages: Check the boxes below to select which emails you'd like to receive. 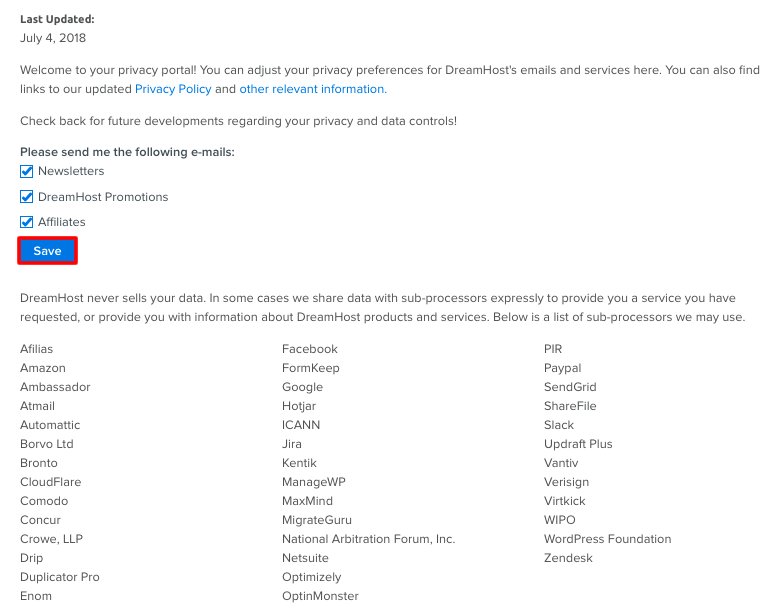 You can adjust your privacy preferences for DreamHost’s emails and services by either clicking the 'Privacy Settings' link shown in the previous section or visiting the following page in the DreamHost Panel. Navigate to the Privacy Settings page. Under 'Billing & Account', click Privacy Settings in the left-side menu. Select which email notifications you wish to receive from DreamHost by checking or un-checking the boxes, and then click the Save button when finished.